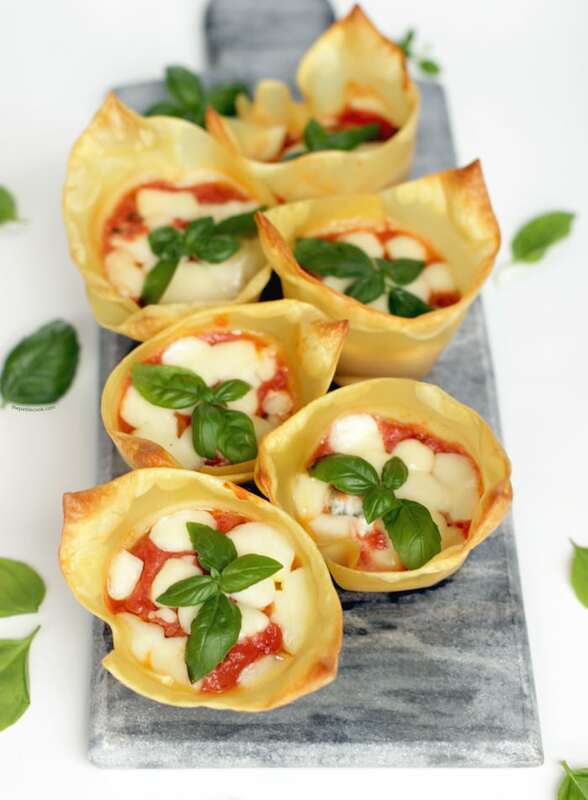 The most easy homemade lasagna cups you will ever have – Awesomely vegetarian, these 4-ingredient savoury cups are perfect party food! These easy lasagna cups are ready in only 20 mins start to finish, and all you need is 4 main ingredients: high-quality lasagna sheets, a fresh herby ricotta, a simple marinara sauce and fresh mozzarella. Ricotta is one of the lightest and healthiest fresh cheeses available, and I literally use it for anything from cheesecakes to savoury tarts. 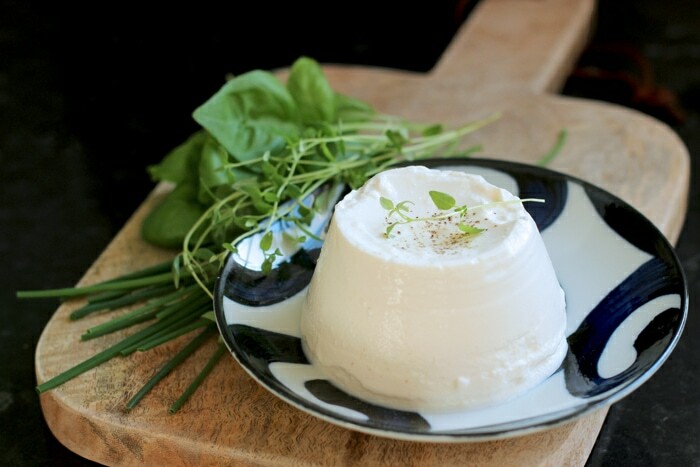 I love to make this herby ricotta, where the cheese is mixed with fresh aromatic herbs and a little lemon zest. I promise it makes a mouth-watering refreshing filling for these delicious lasagna bites! A simple marinara sauce fits just perfectly for these cute lasagna cupcakes. 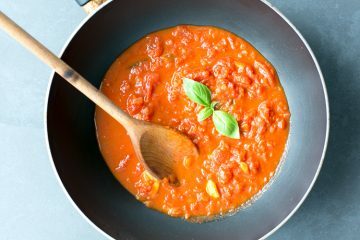 Healthy and made with only 4 ingredients, this sauce is super easy to make. Put all ingredients in your blender or food processor, give it a quick whizz and it’s ready! This marinara sauce is a great passepartout, not only makes these mini lasagne light and utterly delicious, I also use it to make healthy taco pizza cones or grilled parmigiana skewers. 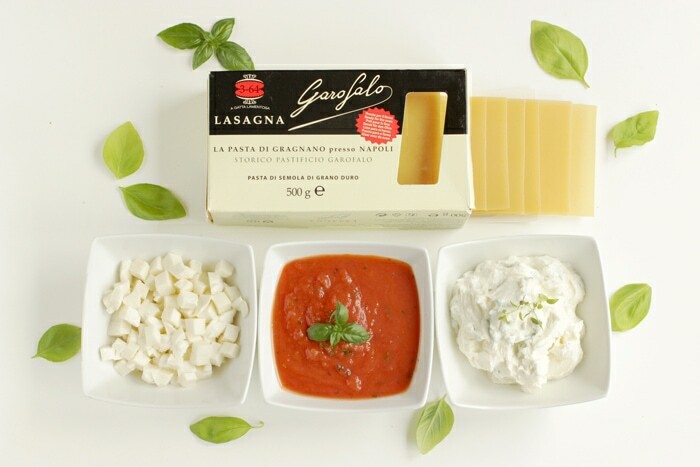 I use Garofalo lasagne sheet for making these pretty lasagna bites. I’ve been a fan of Garofalo pasta long before becoming their ambassador, and I’ve always incredibly loved their lasagna sheets. The pasta keeps al dente even if you miss a minute, and the texture? Hard to beat. 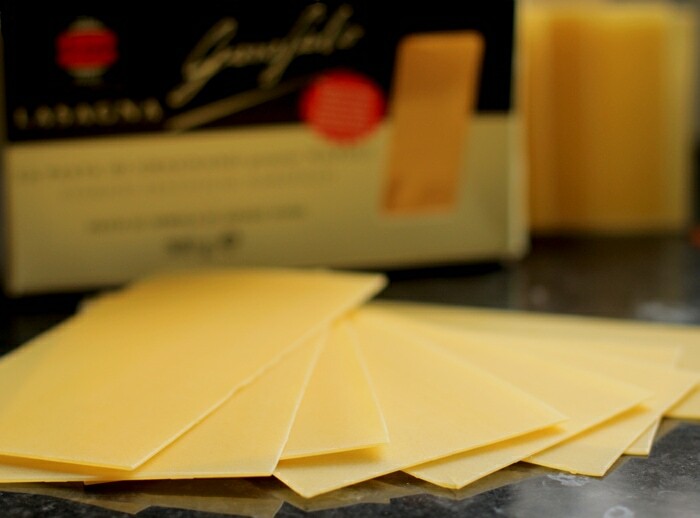 They only use the best wheat durum semolina flour to make their lasagne, which gives that unique rough texture and taste that makes all the difference. 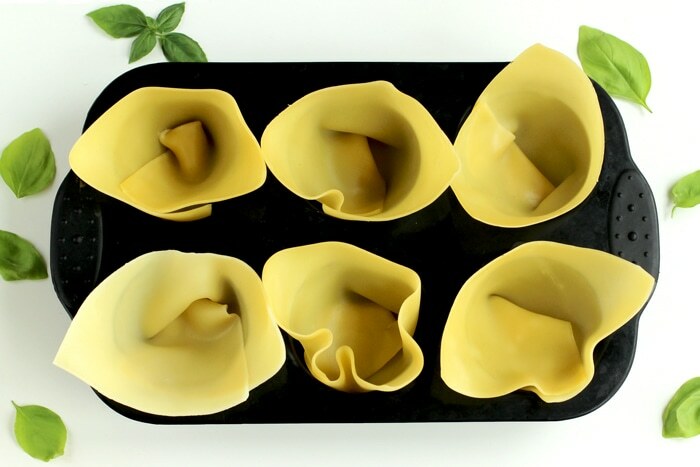 If you’re making a regular lasagna you don’t need to pre-cook the pasta sheets, but for lasagna cups you slightly need to blanch them in boiling water to be able to fit each sheet in the muffin tray. 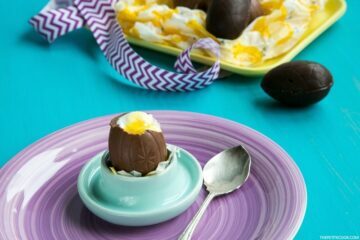 Simple and incredibly easy to make, you can even ask your kids to help you! Blanch the lasagna sheet in a pot of boiling water, drain and pat dry with a kitchen cloth. Fit each sheet nicely into your muffin molds. Fill each “lasagna cup” with a full tablespoon of herby ricotta, spoon over a little marinara sauce and top with cubed mozzarella. Bake in the oven for 10 mins or until the pasta is cooked through and the edges are nicely crisp and golden. Allow to cool a little and devour them immediately! Easy to plan ahead, these vegetarian lasagna cups are a fantastic addition to any barbecue, party, brunch or picnic! 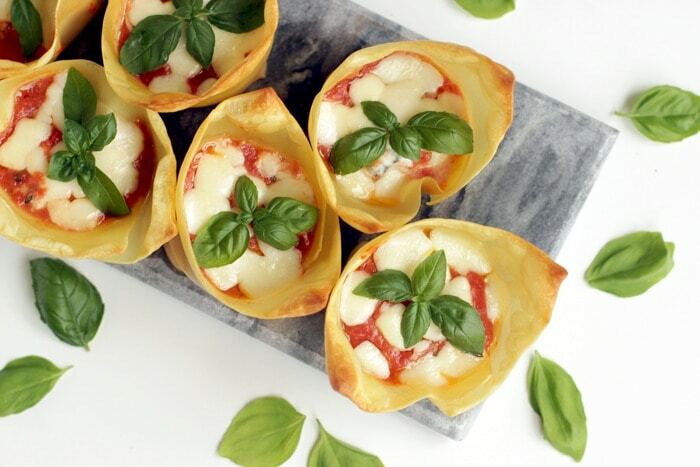 The most easy homemade lasagna cups you will ever have - Awesomely vegetarian, these 4-ingredient savoury cups are perfect party food! Preheat oven to 375F/180C. Lightly oil a 6-cup standard muffin tin or coat with nonstick spray. In a large pot of boiling water, blanch the lasagne sheet for 2-3 min until slightly softened. 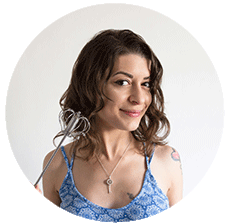 Transfer the herby ricotta into a piping bag or use a spoon. 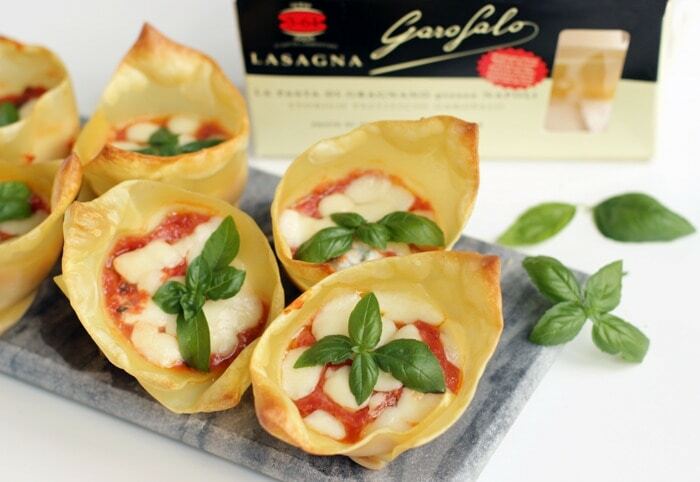 Fill each lasagna cup with 1 tbsp of cheese filling. Add 1-2 tbsp of marinara sauce in each cupcake to cover the ricotta mixture. Top each lasagna cupcake with cubed mozzarella. Drizzle with a little olive oil and season with black pepper to taste. Bake for 10-12 minutes, or until the cheese has melted and the lasagna are cooked through and crispy golden brown. Serve immediately, garnished with basil leaves. Enjoy! 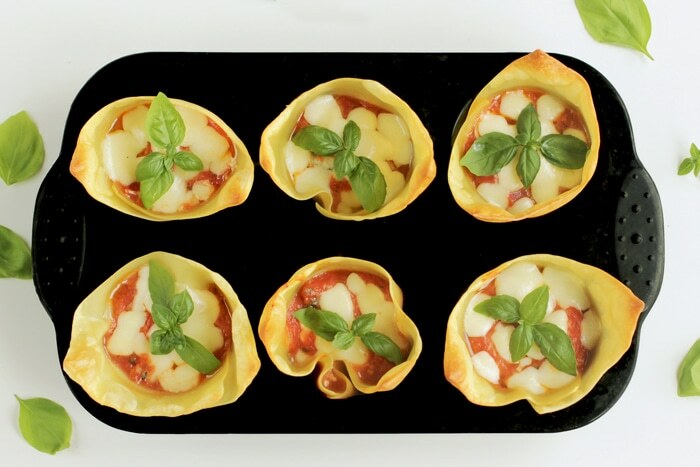 Use a 6-cup muffin pan, alternatively for a mini version use a 12-cup muffin pan and cut each lasagna sheet in half. Thank you Alexa, let me know how you liked it! Amazing. Just my kind of food. How did you think of these? Can I make them and feature on my blog with proper attribute and links? Thank you Dina! I think muffin-size is the perfect size for everything (and you can have seconds with no guilt). So I thought, why not lasagna? 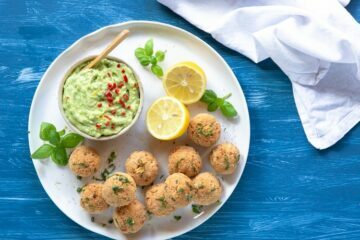 And here we are 🙂 Of course you can make them! If you feature the recipe on your blog please don’t forget to re-write the recipe in your own words and leave credits and link 🙂 Thank you again, hope you enjoy these! Well these are the cutest lasagnas I’ve ever seen! I love this idea. Nice work.